Scientific name: Phytoseiulus persimilis, Phytoseiulus longipes, Amblyseius californicus, Amblyseius sp. Region: This bug is found, in various species, throughout North America. Life cycle: Numerous generations per year and often requiring only a couple of days and breed twice as fast as Spider Mites. They are voracious predators that attack Spider Mite populations until they are completely wiped out. They then will move on to another area, or become cannibalistic and begin preying on each other, or die of starvation. Physical Description: These Mites are orange to red in color, .02 inches (.5 mm) in length, and look very similar to Spider Mites. To distinguish between the two, Predator Mites are shinier, lack spots, and their eggs are twice as large as Spider Mites are.. 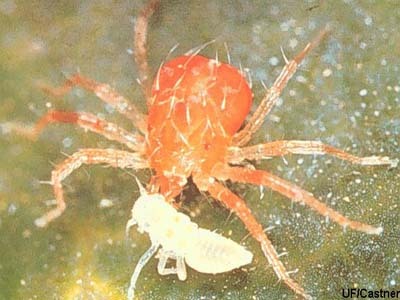 Feeding characteristics: The adult feeds on Spider Mites (egg, larvae, pupae, and adult) and Thrips. Their mouths have extensions they use to attack and kill their prey. Constantly on the move to seek out prey, they only stop in order to feed. They function best in dense foliage that allows them to move from one plant to another. They can consume up to 20 mites or eggs in one day, and are considered the best biological control for Spider Mites. Controls: No control is necessary. Purchase Predator Mites at Organic Garden eStore.